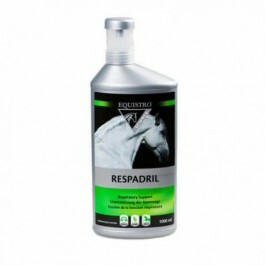 Equistro Respadril is a liquid complementary feed designed to be added into a horse’s daily ration, drinking water or directly into the mouth. It is particularly recommended for short term respiratory system support. Before being released on the market, every Equistro Respadril batch is analysed for environmental contaminant, ensuring that the product does not contain ingredients likely to make a positive doping test. What are the benefits of using Equistro Respadril? 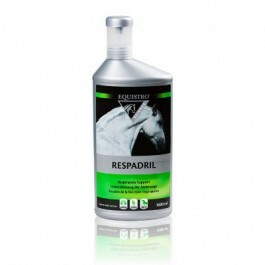 What is in Equistro Respadril? Sugar, 1,2 Propanediol. Additives /kg: Composed of trace elements; Copper as Cupric chloride dihydrate (E4) 800 mg. Aromatic: Glycyrrhiza glabra (liquorice) extract 56000 mg, Essential Eucalyptus oil 12000 mg, Essential Origanum oil 4000 mg, Essential Pine oil 4000 mg, Glycine 2000 mg.
How do I use Equistro Respadril? Horses (500 kg): 40 ml per day for 5 days. Foals/ ponies: 20 ml per day for 5 days. Give with food, drinking water or directly in the mouth. Is there any further advice I should know about Equistro Respadril? Due to presence of trace elements with maximum set limits, administration must not exceed 280 ml/ 500 kg horse/ day.